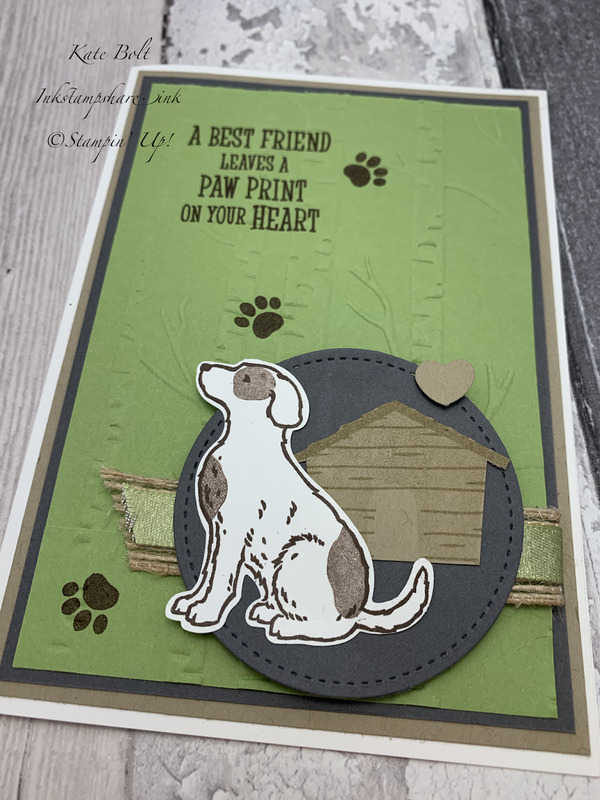 Inkstampshare: Happy Tails! Just Fur You! Happy Tails! Just Fur You! 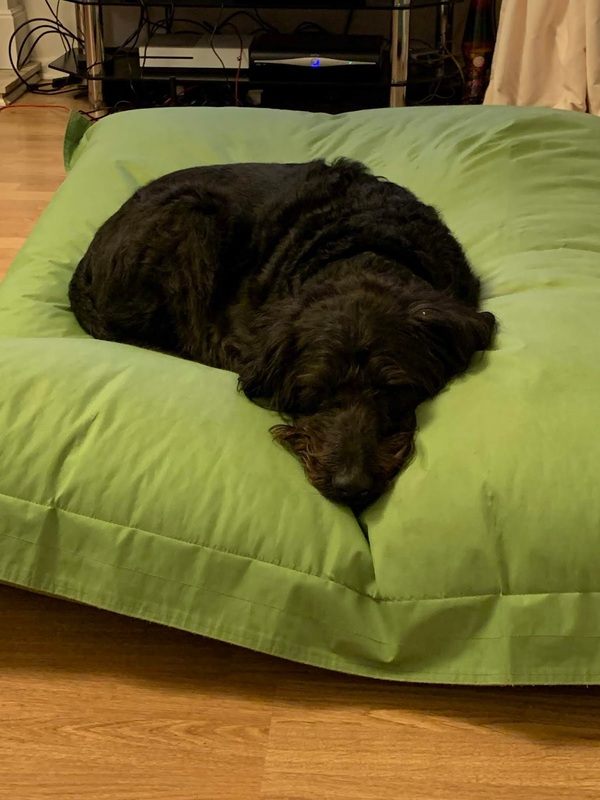 Happy Tails - Just Fur You! 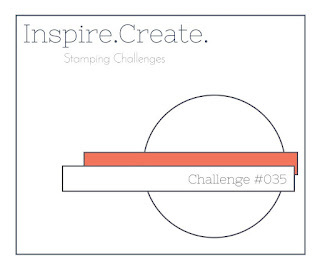 This time, in the Inspire Create Challenge we have a sketch challenge! Are you a cat or a dog person?Or maybe both? 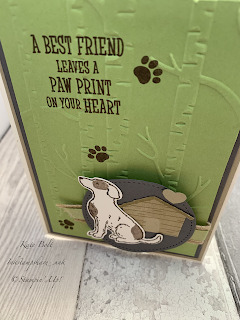 I have been itching to play with the Happy Tails stamp set and Punch Bundle and this was the perfect excuse! Here is our sketch. I think I kept to it fairly well don't you? The dog stamp is very versatile. 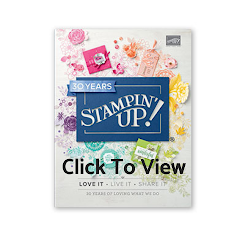 His outline stamp is separate from his "patches" so you can stamp him without them. There are also spots too 😊. 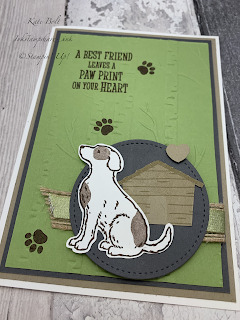 There are lots of fun dog themed images and great sentiments in the set. I think I'm going be using it a lot. 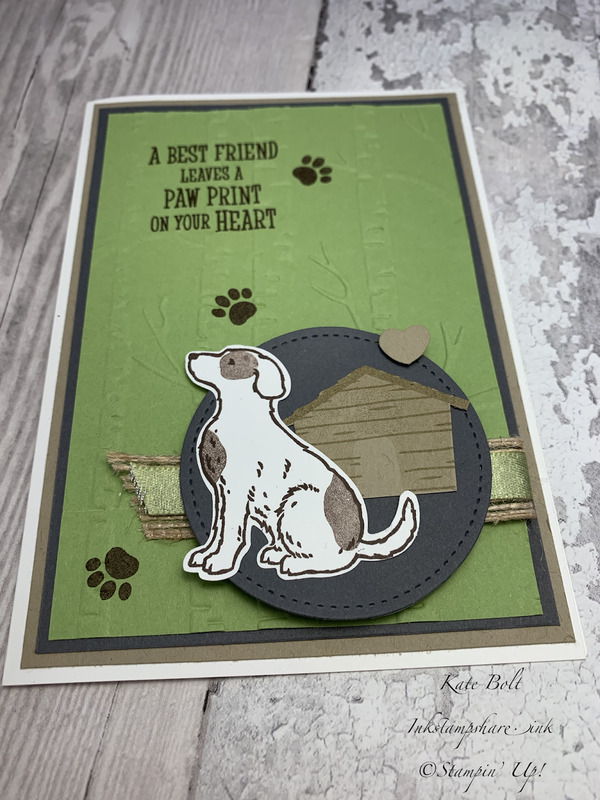 His colour is nothing like our lovely black Labradoodle (who is asleep here on his bean bag 😀) Perhaps my next card using this set should feature him! The card base is Whisper White. A4, scored at 10.5 cm and cut in half at 14.9 cm. The layer is Crumb Cake. 10cm x 14.3 cm. A layer of Basic Gray. 9.5 cm x 13.8 cm. The top is Pear Pizazz. 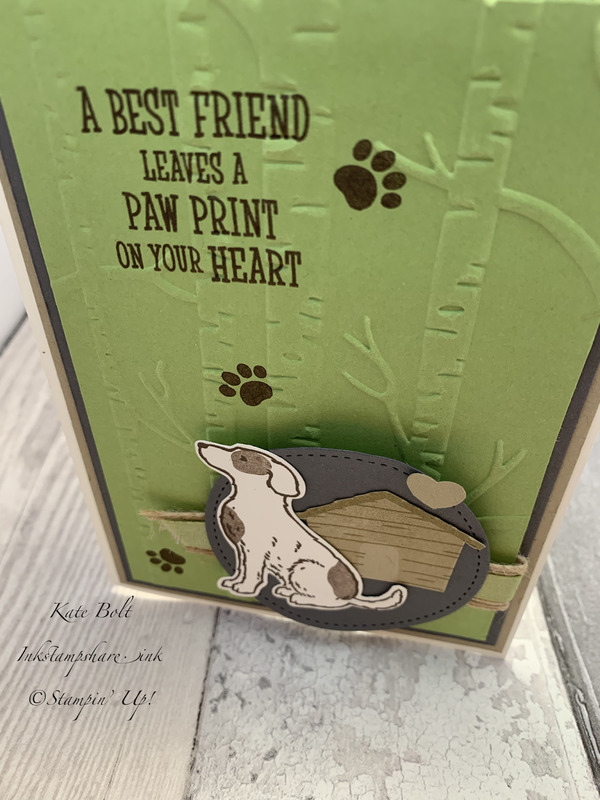 9cm x 13.3 cm, stamped first in Early Espresso and then run through the Woodland Embossing Folder. A length of Burlap and Pear Pizzazz Ribbon is attached to the Pear Pizazz Card before adhering down. The Basic Grey Circle was cut out using the Stitched Shape Framelits and used as an anchoring point for the card elements. 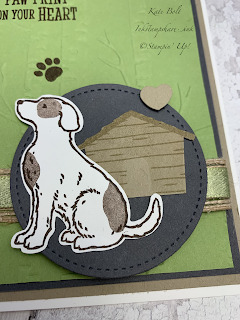 The dog was stamped in Tuxedo Black Memento Ink onto Whisper White and punched out. His patches were stamped in Early Espresso - stamped off first onto scrap paper. His kennel was stamped in Crumb Cake Ink onto Crumb Cake card and cut out and the little heart was also punched out using the dog punch builder punch. I hope you like it! I'm looking forward to making quite a few more projects with this set. Look out for those. 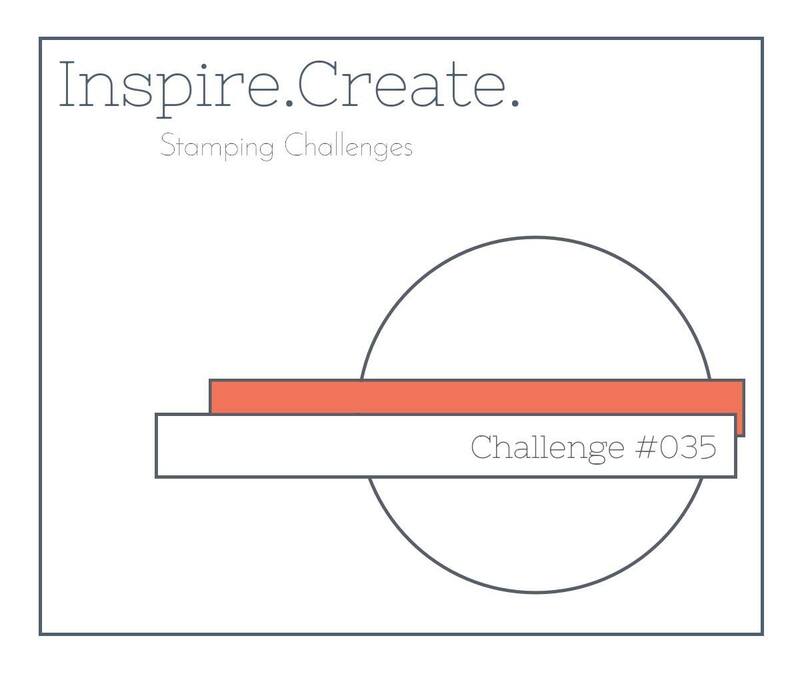 Grab a cuppa and head over to the Inspire Create Stamping Challenge #035 here to see what the rest of the talented Design Team have come up with for the sketch challenge. Do join along, it's so much fun and we would love to have you. 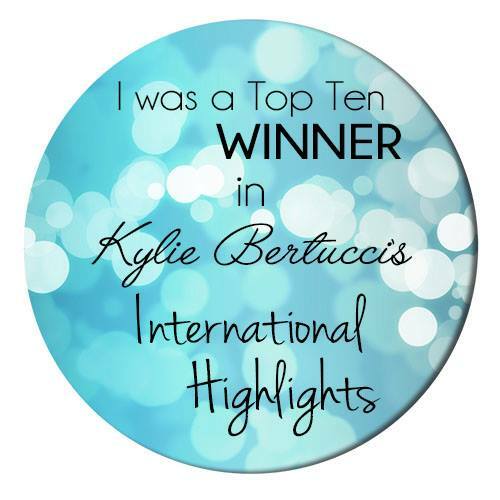 You can link it to a blog or FB or Pinterest Post. It's easy to do and the instructions are there at the top.